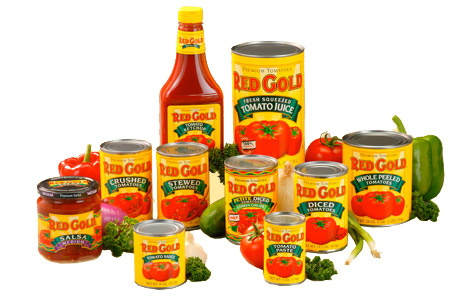 Today is the first in an ongoing series of posts featuring Red Gold tomato products. As many of you know, I visited Red Gold’s corporate headquarters in Indiana this past February as one of the winners in their Taste of the NFL food blogger contest. I was already a fan of their products before that trip, but I left Indiana with a deep appreciation of their commitment to their products. On top of that, the Reichart family and their employees are basically the nicest people you’d ever want to meet. That’s why I was so thrilled when they asked me to continue partnering with them to feature some of their tomato products and recipes for you! I would never steer my readers wrong, so you can believe me when I say that Red Gold is the only brand of canned tomatoes that I use in my kitchen. I witnessed first-hand the enthusiasm that they have for their products...and the passion that they have to create high-quality products. They recently sent me two cans of their petite diced tomatoes to cook with and share the results with you. I visited their website to check out their recipes...and one side dish immediately jumped out at me: Corn Maque Choux (pronounced mock shoo). It’s a Cajun dish that features fresh-from the-cob sweet corn and Red Gold petite diced tomatoes. Oh, did I mention that it has bacon too?!?!? I made a few tweaks to Red Gold’s recipe since we like our food on the spicy side. I subbed half of a poblano pepper in place of bell pepper, and I added some of my favorite Cajun spice blend to up the spice factor even more. To save a bit of time in the kitchen, you can use frozen corn kernels in this dish. That said, fresh sweet corn is at its peak right about now, and it only takes a few minutes to cut the kernels fresh from the cob. It's worth it to enjoy fresh-from-the-cob summer corn while it's at its peak!! Step 1: Cut two slices of bacon into pieces; add to a large non-stick skillet and cook over medium heat until golden. Drain on paper towels and set aside; remove all except 1-2 tbs. of the bacon grease from the pan. Add 1 cup diced yellow onion and half of a diced, seeded poblano pepper. Saute until the onions start to turn golden...about 5 minutes. Add 2 tsp. of your favorite Cajun spice blend. While the veggies cook, cut the kernels off four ears of corn...making sure to go back and scrape the sweet milk and pulp from the cobs after you remove the kernels. You should have about 4 cups of corn. Add the corn to the skillet and stir to combine. Step 2: Cook for about 10 minutes, stirring occasionally. Then add 1 well-drained can of Red Gold petite diced tomatoes. Stir to combine and continue cooking for another 15 minutes, until the corn is tender. Step 3: Turn off the heat and add 1/2 cup half and half, 2 sliced green onions, and the reserved bacon pieces. Stir to combine, transfer to a serving bowl or platter, and serve. Wow...this dish pops with all sorts of vibrant colors and flavors! The juicy tomatoes, sweet fresh corn, and smoky bacon combine perfectly. Plus, the half and half gives the dish a subtle richness in the background. If you like your food less-spicy than we do, simply use bell pepper instead of the poblano...and reduce or leave out the Cajun seasoning. This is a fantastic Summer side dish...I served it with Cajun turkey mini meatloaves and mashed potatoes, but it would pair nicely with any grilled meat.